Snowlord---I LOVE it when you include your own examples of how a specific picture could be recreated. I think everyone benefits when you show us that it's possible to get a similar effect. What might be even more helpful is if you explained what you did to get these effects. Great pics! They come off very spooky! 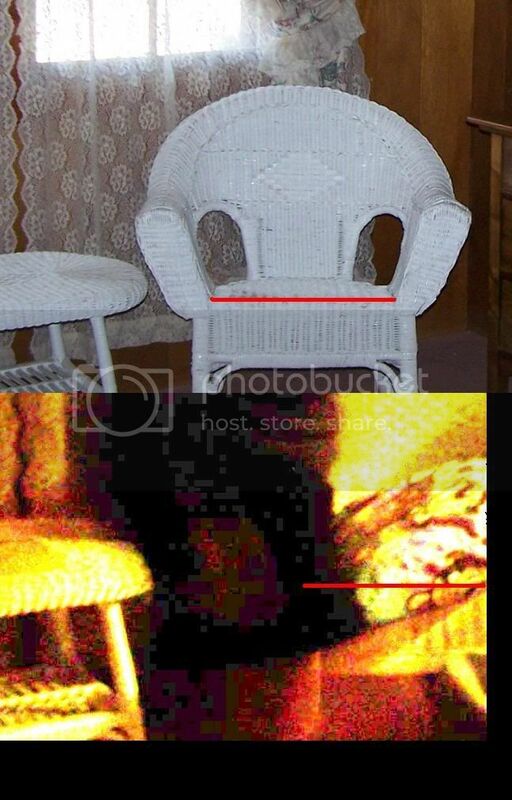 This just proves what I'm saying.You intentionally created these pictures so they are fake and non-paranormal.On the other hand,RJuarez didn't manipulate his photos so they are true and they are a picture of a shadow man.My point all along.It's not the photo it's the photographer that's in question. If you believe the photographer saying that he didn't manipulate the photo and that there was no-one standing there then you believe his photo.Plain and simple. I believe RJuarez and so I believe his photo and all his comments that come along.If he is deliberately trying to fool us then,ok.It's his and everyones loss and should really get a life.As I said though,I believe him. Thanks again RJuarez and thanks Snowlord for all your effort and replies! Yeah...thanks Snowlord for taking the time to do this. I agree with Malestrom, it really does just come down to whether one believes the photographer in this case. 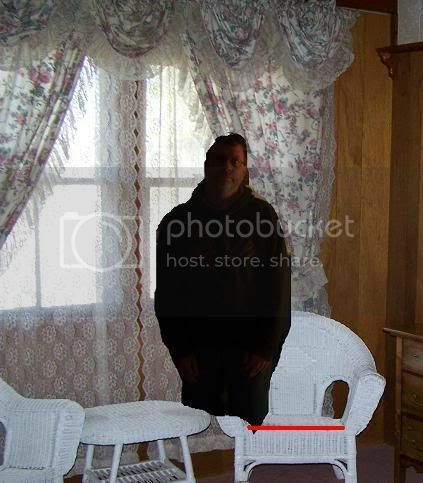 So, how can we believe that you created this shadow person and just didn't use one of your REAL shadow person photos??? Not necessarily plain and simple. Although Snowlord demonstrated that he could create a shadow person, I believe his point is that many natural things, be it related to the camera or the environment can cause seemingly paranormal pictures. That's why corroborating evidence helps to make the picture more believable. Example: Many times we have gotten what looked like orb movement on video. But dust in the air and insects can cause the same effect, so that is usually thrown out as evidence, or maybe looked at as interesting, but IMO not proof. But in several cases we have gotten the orbs to interact with us and do things we asked AND gotten EVP's responding to what we were saying at the same time.....so that lends credence to the possibility that these particular "orbs' may not have been dust or insects (unless insects can understand us and talk!) but perhaps related to paranormal activity. Just for the record, yes I am saying this is a spirit, something "paranormal", I was alone at the time the image was taken. What else could it be? Those that know me know it is not in my character to be fabricating such a story or image. Snowlord for discussion purposes I like the 5th, last one, of your images. It is dark and has the most likeness to my image. You have replicated the original pretty good, but since you are trying to replicate the image,I think the image should be duplicated as close as possible. What I am saying is this; my image is dark, lighten it, mess around with it, the dark shadow takes a human form. Yours is also dark, lighten it and it stays solid. Nothing materializes. Just a dark figure. I would say the reason is due to the fact yours is an obvious fake to prove a point. Mine on the other hand is a shadow which is why the "shadow" can be removed to reveal the solid human figure. Does it mean anything? I don't know, I'm not an expert just an interesting observation. "I agree that an image can be convincing if all normal things have been ruled out, but they haven't been in this case. " You have to be willing to accept I was alone. If you accept this, then what else could have caused this image to materialize. "Of course I am not an authority on what spirits look like ... are there actually any authorities, anywhere?" Of course you are not an authority but you make a statement about real human proportions, or facial details as if you know for a fact what a spirit would look like. That's what I meant, there are no authorities on this matter. And no offense taken snowlord, I am enjoying this discussion. That is ONE creepy photo! Thanks to everyone for putting up with me and my extreme views. Dem0000 ... 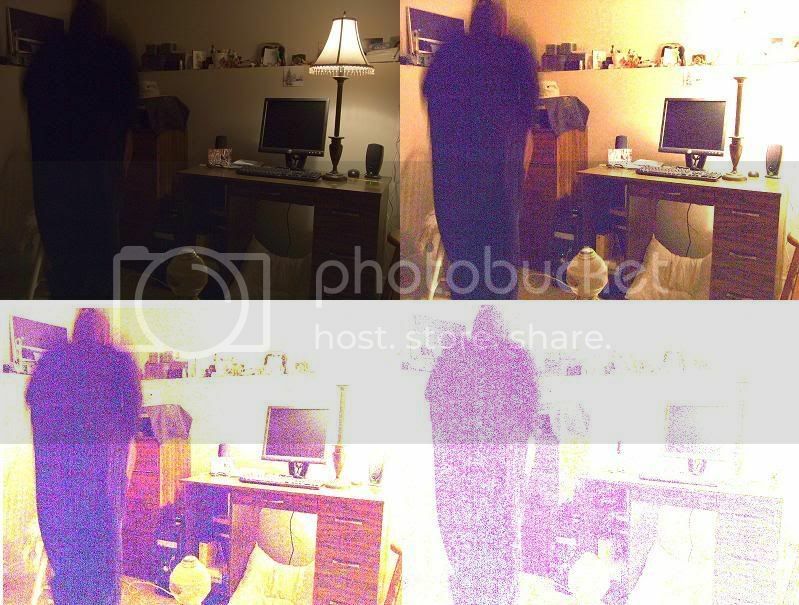 Sorry you are only getting the fakes, but I am saving my "real" shadow person photo's for future use. RJuarez ... How one of these pictures looks when lightened all depends on the type, and amount, of lighting and movement in them. Some of the pictures I discarded were obviously a person, "me", when I lightened them as a test, so I thought they would be unsuitable for this experiment. I think the picture you chose to brighten up gives us a good example as to how unreliable the information contained in these "low light" pictures can be. The picture of mine that you lightened up and chose for your example is just me, nothing else. Nothing else was used in that picture, no photoshop, no dummies, no other objects. Its just me moving slightly in a slow exposure that was set up to be similar to the exposure in the picture you posted. Except for the head and shoulder shape at the top there is absolutely no information in that picture that points to it being a real human being, dressed in normal clothes. To my mind this points to the unreliability of these types of pictures. 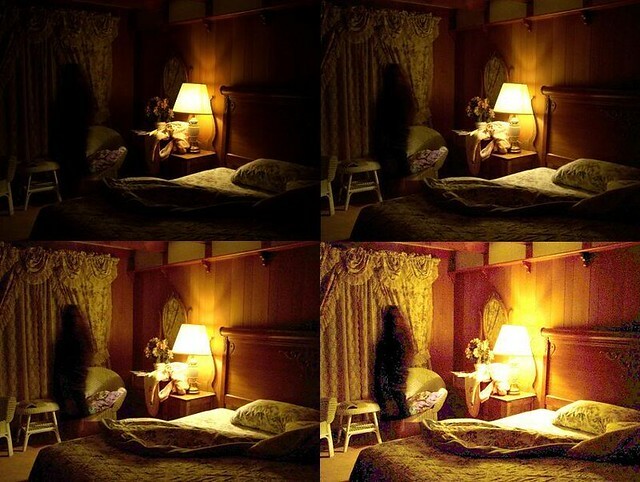 I think that as far as a lack of shadow being cast goes, the lamp is actually more in line with this figure than it appears in the picture, and so the shadow could be out of frame to the left of picture. At least it looks like that could be possible to me. You should be able to see some of the shadow on the small table tho. And you can! If the shadow we see on the table is from the shadow person, it should also cast a shadow on the curtains. If the shadow was cast right behind it(wich is very unlikely in any case) it would show in the mirror. Great cap! thanks a lot for putting it up!! Personally i have only ever seen one ghost picture I believe to be real. The only reason I believe so is that I would trust the person who took it with my life. 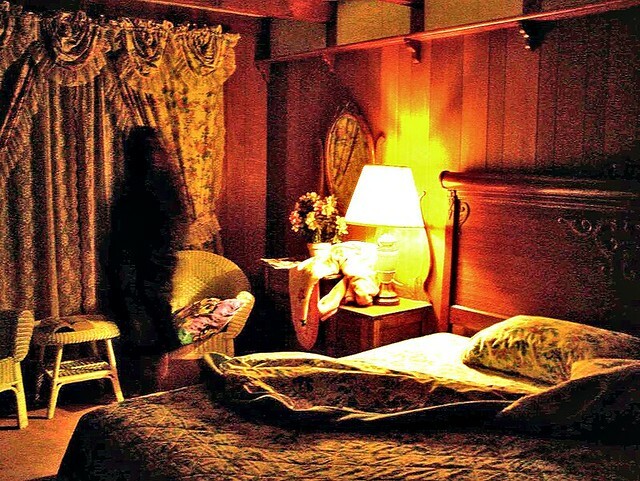 If you are to believe it was a human in the picture with motion blur then you have to believe there should have been a shadow cast on the drapes and should have been in the mirror's reflection. The other point I would make is the position of the figure. It's not in a "walk way" and would be impossible for someone to be standing where the figure is positoned. Also take into consideration the figures legs don't extend to the floor. I know you are very skeptical but I was alone at the time. If that is a fact (which it is) what else could make such a shadow? Sorry for the wait to reply, but I was out at the cottage for a couple days. While I was out there I took a few more pictures that might help explain my point of view. I tried to make a set up that was as close as possible to the original picture, and tried to use the same lighting and such. I actually had to put a tea towel over the lamp to get it nearly as dark as the original picture. My light bulb was too bright. As for the shadow and reflection question, I found out that no, a real person would not cast a shadow or reflect in the mirror. In this picture I am standing at the best possible approximation of the spot this shadow being was in, and as you can see I am not reflecting in the mirror beside the lamp, even though the wall directly behind me is. And my shadow is out of frame to the left, not on the wall behind me or even near me. A person could easily be in this position if they were up on their knees like I was, or even just moving their lower legs enough not to register in the low light exposure. So it is possible for a real, physical person to have made this shadow. Ok ... the point of this is not to say it "was" a real person there, but just to show that it "could" have been. This eliminates the claims made that a person couldn't be there because of those reasons. Now, on to the other possibilities. If there was no other person in the room ( which, by the way, there wasn't in any of the pictures I took either ) then you must accept the "possibility", just the possibility, that something simply got in the way of the camera lens. This could be something small, and so close to the camera that it just wasn't noticed. And don't bother asking me what it was, or what it could have been, because that is a pointless question since I would not have any way of knowing that. Here is a picture of a small, less than an inch, piece of dark cloth "accidentally" getting in the way of my lens, at a distance of about one inch or so. It appears very similar to the dark thing in the original picture. Things like this can appear to be behind background objects and have these background objects seeming to extend in front of them due to the way the camera records light around the blurry edges during a longer exposure. More movement in the object would have resulted in more of the background showing through and would have made pareidolia possible from background details. Feel free to adjust it as much as you want. I have included a brighter version of it also. While I was taking these pictures another type of anomaly showed up ... the wonderful "motion blur". I thought it looked spooky enough to include it here. Again this was less than two inches in front of the lens. As always, I am not trying to prove the original picture is a fake. I am trying to prove that it does not have to be paranormal, as has been claimed. If anyone wants to believe that this picture was of paranormal origin then that is their right, and no one can prove them wrong. I do believe that I have convincingly shown that normal, mundane possibilities exist, and therefore a claim of "definitely paranormal" is not supportable. These pictures that you've posted are definitely examples of "walking the walk"
Thanks for sharing these with the forum. 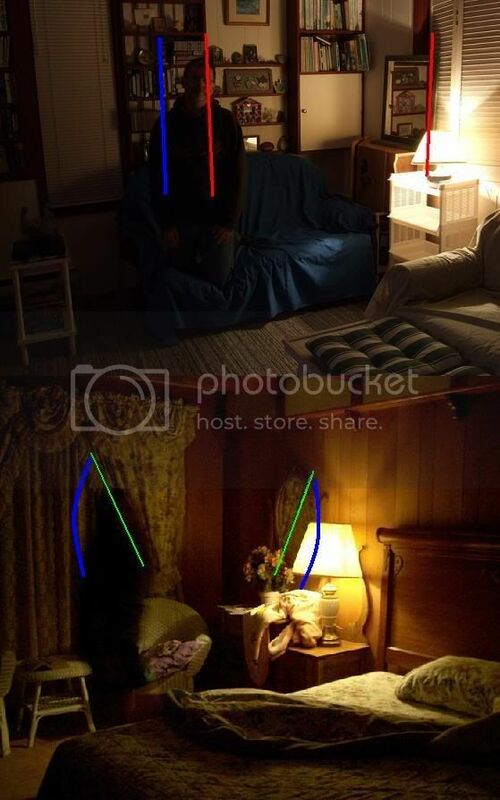 As you stated these definitely give credence to the fact that something does not "definitely" have to be paranormal. I always go back to our pictures although fun to share with the forum are only "evidence" in our own eyes and can never be used to "prove" anything to anyone but ourselves. Ha! I hadn't read this thread since I posted on it a few weeks ago! It's awesome. I am LOVING it. You know the best part is seeing people who I haven't seen chime in in a long while putting in their 2 cents. Everyone seems to agree that the shadow(spirit?) stops in front of the chair. Does no one else see legs in front of the chair? Honestly, since I first started on this site, this is easily one of the best caps I've seen. I love all the different POVs, I especially like Snowlord's methods of debunking, or at least explaining ways that it could be less than supernatural. I've only posted a few photos since I've started here and he's been very insightful so far. A good example was my "hair or fiber" pic, which was the only pic I got that night, and hair or fiber didn't even cross my mind, even though I've seen it before. Anyway, this is easily one of the coolest shadow person caps I've seen, and I've seen a lot, so therefor I hope it's genuine, and I have no reason to believe it's not. I'd be ecstatic if I caught a pic like that, and not in a freaking out kind of way. btw, I also noticed the legs stop, yet the chair keeps going to the floor, so it looks as though the bottom half of its legs are transparent or it's just hovering. Just my two bits. Edited by Joe Joe, 15 May 2008 - 11:18 AM. To the OP and everyone else that posts pics here----thanks to ya'll as well for sharing them with us. Thanks. I'd be happy to look at your pictures. And anyone else's. I think its a good thing to have a second opinion on these things. Snowlord, in your picture, if the mirror would have captured up to the blue line, you may have cast a reflection. I did another picture for reference as to what I am saying. In mine it seems like there should have been something captured in the mirror going to the blue line. Maybe I'm wrong. Just seems that something even just a hint of the figure should be there. This image shows what I am saying about it being next to impossible for a human being to be in the figures position. Another pic for reference. The red line again shows where you would sit. Also consider it's wicker, no cushions and will not give.